Through different dynasties period, restoration and extension works were carried out to this temple complex with the inclusion of gardens, ponds and pavilions to beautify the complex compound. 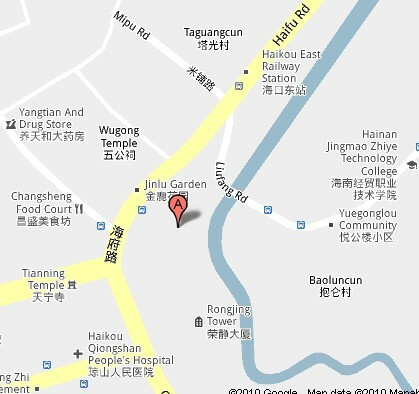 Wugong Temple (wǔ gōng cí 五公祠) is located in Haikou City (hǎi kǒu shì 海口市) of Hainan Province (hǎi nán shěng 海南省). It is only 5 kilometers away from the downtown area. 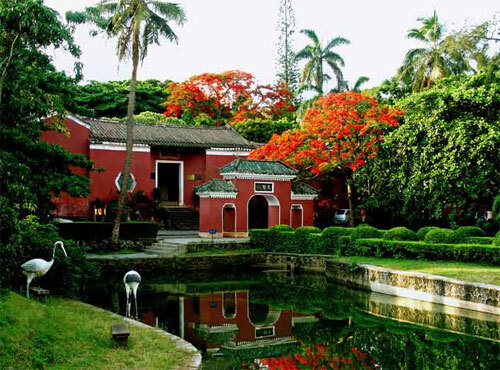 It was built in the Ming Dynasty (míng cháo 明朝) in memorial of five historical celebrities who had been relebrated to Hainan in Tang (táng cháo 唐朝) and Song (sòng cháo 宋朝) dynasties. 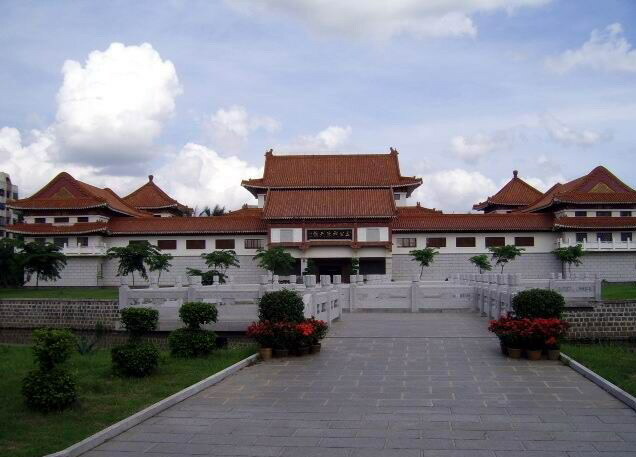 Covering an area of more than 2800 square meters, the temple constitutes the Guanjia Hall (guān jià táng 观稼堂), Xupu Hall (xué pǔ táng 圃堂) and East Building (dōng zhāi 东斋), and linked up into a single stretch with the Sugong Temple (sū gōng cí 公祠), Fubo Temple (fú bō cí 伏波祠), Qinbai Pavilion (qí bài tíng 其拜亭), Dongzhuo Pavilion (dòng zhuó tíng 洞酌亭), Suquan Pavilion (sù quán tíng 粟泉亭), Xixin Pavilion (xǐ xīn xuān 洗心轩) and Youxian Cave (yóu xiān dòng 游仙洞). The so-called No.1 Building in Hainan (hǎi nán dì yī lóu 海南第一楼) is a 2 storied wooden building, which is more than 10 meters high. The building is painted red, covered with black tiles. Together with the green trees, the building is in a solemn and awe-inspiring atmosphere. On the left part of the Wugong Temple, there is the Xuepu Hall and Wugong Hall (wǔ gōng jīng shě 五公精舍). The two halls are with the decoration style of Ming and Qing dynasties. On the east part of the temple, there is the Sugong Memorial Temple (sū gōng cí 苏公祠), which is in memorial of the famous literateur Su Shi (sū shì 苏轼) of the Northern Song Dynasty (běi sòng 北宋). 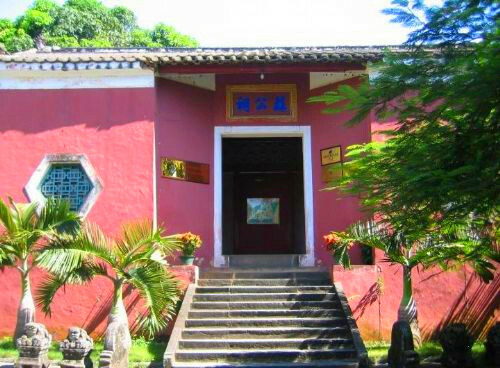 In the temple, there are the relics of Shuangquan Pavilion (shuāng quán tíng 双泉亭) and Dongzhuo Pavilion (dòng zhuó tíng 洞酌亭). 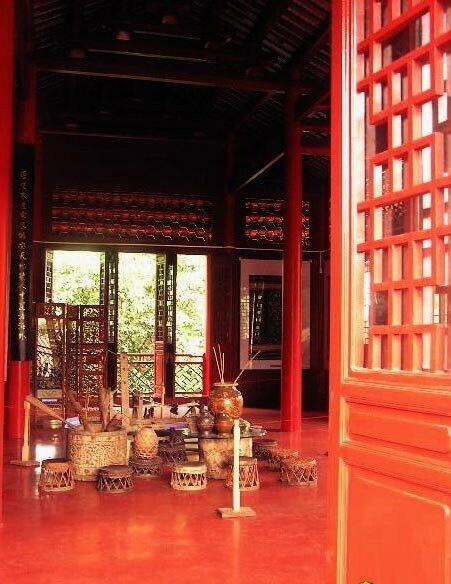 The Sugong Temple is a courtyard of landscape style. With halls, green trees and flowers are well proportioned. On the left part of the Sugong Temple, there is the Qiong Garden, which covers an area of nearly 10 mu. 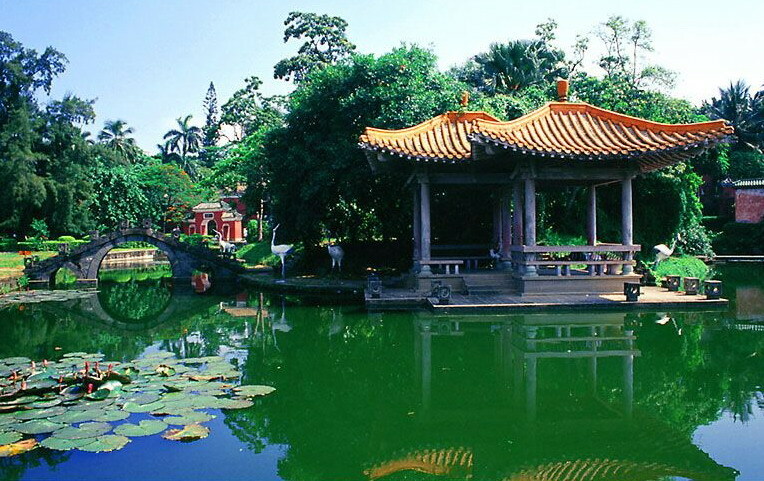 In the garden, there is the Fusu Spring (fú sù quán 浮粟泉), Suquan Pavilion (sù quán tíng 粟泉亭) and Xixin Pavilion (xǐ xīn xuān 洗心轩). It is said that the Fusu Spring is discovered by Su Shi (sū shì 苏轼). The spring is clean and sweet. It is crowned as the Best Spring in Hainan (hǎi nán dì yī quán 海南第一泉).